Well, it happened again. Liberals are able to do what no marketing firm representing a manufacturer or vendor can do when it comes to raising gun sales volume. The more insanely they bellow about “high capacity clips”, “assault rifles”, “military weaponry” and “well regulated militia”, the higher gun sales volume goes. 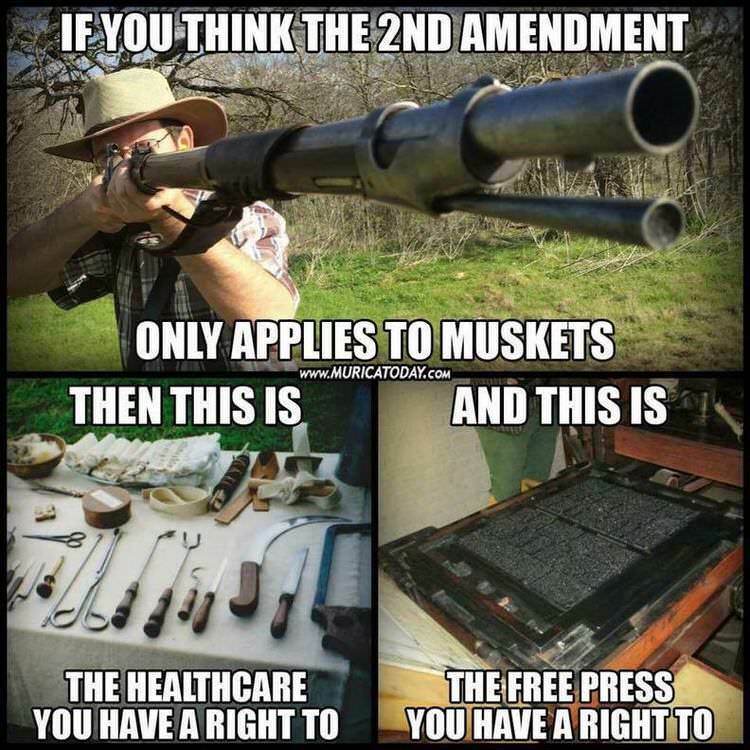 Let us first be aware of the Second Amendment. “A well regulated Militia, being necessary to the security of a free State, the right of the people to keep and bear Arms, shall not be infringed.” Liberals/progressives want to concentrate on the words “well regulated Militia”, forgetting that without arms any formal grouping is useless against a heavily armed tyrannical government. They also like to bring into the conversation the likeness of a musket to a semi-automatic rifle. Here’s what happens to their “living/breathing document” argument. For my money, if some despot leading the government authorizes the use of automatic rifles to suppress the citizenry, then “We the People” should have like weaponry to defend our freedoms. I’m okay with civilians having fully automatic weapons (now illegal in most states). Their non-combat use might be restricted to sanctioned ranges with heavy fines or imprisonment for unauthorized use beyond that scope. But, when the time comes, we must be able to defend our lives, our freedoms and our dignity by any means possible from those who choose oppression over freedom. It is also imperative that each and every gun owner pass an accredited class in Basic Handling and Firearm Safety. While not advocating for another “tax” aka license, the school or instructor should issue a certification attesting to the attendee’s knowledge and ability to comply with reasonable standards. Today, to purchase a firearm, there is a very reasonable $10 fee for a federal background check. It’s the responsibility of the feds to collect and secure the required information for that $10 before issuing a permit to purchase. We were told that giving up some of our privacy to enact the Patriot Act would allow federal agencies to interact with local law enforcement and share information to keep us safe. Well, our privacy and some of our liberties are now gone, yet there is still inadequate responsible information sharing to keep us relatively safe. Let us not lose more with little to nothing in return. Nikolas Cruz, the Marjory Stoneman Douglas High School mass murderer, was on medication to deal with “emotional fragility”. Those who have read my previous writings on this subject are well aware of my take on synthetic pharmaceuticals. I am not a doctor or a pharmacist. I am a civilian citizen who is concerned about the number and types of things we are seduced into ingesting in the name of health. Though the concentration today is on medications to overcome the symptoms of anxiety and depression, they are not my only concern. I have friends and relatives on as many as 19 drugs taken regularly…most commonly every day. Some of the drugs are to counter the side effects of the drugs taken to allay the side effects caused by other medications that are taken to mask the symptoms of a root problem. In my view, synthetic pharmaceuticals are too often prescribed to move a patient out the door so that the doctor can record another patient visit. Most synthetic pharmaceuticals do nothing more than hide the symptoms of illnesses rather than treat or remedy the underlying problem. Some, if not all, have a list of “potential” negative side effects which are far worse than the problem displaying the symptoms they are meant to overcome. All too often, there is little in-depth monitoring of the patient’s reactions to the prescribed panacea. Stephen Paddock, now of Las Vegas fame, was on Diazepam. According to the FDA, diazepam can produce confusion, withdrawal symptoms, euphoria, increased anxiety, panic, irritability, delirium, aggressiveness/aggression, numbed emotions, instability, restlessness, agitation, inappropriate behavior, delusions, rage, hallucinations, nightmares, confusional or paranoid psychosis/psychoses in up to 10 percent of users (and that estimate might be generously low). Drugs.com offers some answers to the horror of today’s society. Click on “A to Z drug list”, pick a letter, a drug, then scroll down to side effects and scare the hell out of yourself. Almost every one of the mass killers and teen suicides of the past two decades have been using prescribed synthetic pharmaceuticals with horrendous potential side effects. A few well-known names associated with mass atrocities that you may recall are: Prozac, Ritalin, Effexor, Celexa, Paxil, Zoloft, Welbutrin. Those are the names of the real killers. While the direct weapon most commonly used is a firearm, the list of multiple killings and suicides range among ropes, cars, trucks, knives, ice picks, baseball bats, 2x4s, hammers, screw drivers, machetes, explosives and on and on. Whatever is available when the medication kicks in becomes an instrument of choice. Thanks in large part to our Community Organizer in Chief, ambushing police and riots are now commonplace. Violence abounds. There is unrest in every pocket and every major city across the nation and it is seemingly being promoted by our current administration and endorsed by his justice department. Each time there is an incident in which innocents are killed, President Obummer addresses the nation and two things happen. First, there is an insincere placating to the families involved. Second, and almost within the same sentence, comes a statement about how Muslims or blacks (depending on the specific situation) have been oppressed since the beginning of time and therefore righteously rebelling against white men and police is justified and acceptable. He is effectively granting permission for violence and killing. There are other forces contributing as well. If it isn’t directly political as in Hillary escaping an FBI criminal investigation where Director Comey publicly justified indictment yet set her free without such recommendation or Donald Trump hurling true but volatile remarks, it’s Black Lives Matter projecting animus toward law enforcement or the New Black Panther Party (one of the president’s favorites along with The Muslim Brotherhood) calling for the killing of all whites and cops. As soon as that settles, our president finds the words to enflame another situation. This happened in Dallas recently because of two incidents involving police officers and black men. I have reviewed the publicly available videos of the shootings in both Baton Rouge. LA and St. Paul, MN. According to the footage made public, both might be considered questionable shootings. But that assessment is made on limited information. I was not there for either and felt no fear for my own life. We’ll know more as time develops the stories. As of this writing, the police death toll in Dallas is five with seven other officers wounded. The gunman wearing an armored vest. An ambush in Baton Rouge has left three police officers dead and several wounded. Police patrol and do their job enforcing laws with trepidation now because approaching any suspect can mean their death or maiming. Simply being on the street has seen 8+ of America’s brave lose their lives in the past two weeks. Thus, they act quickly and with angst. The reasonable concern for their own lives causes rapid aggression and reaction without forethought. The recent spate of ambushes can only cause quicker to reaction to a sudden movement or refusal to comply with their commands. Radicals are taking over in anarchy, without forethought but with direction and guidance, subtle or outright, from the leaders of national organizations local authorities and our president and his justice department. At least one report says that Democrat Cleveland Mayor, Frank G. Jackson, has issued a “Stand Down” order to his police force during the Republican convention. Essentially, he has given protesters permission to riot in the streets. It worked so well in Baltimore! And, like Baltimore, this usually results in looting and burning local businesses. Tens of thousands of dollars in unnecessary destruction is likely to occur in Cleveland. The anarchy is escalating and currently looks like it will not stop soon. The disregard for law and order generally associated with third world and socialist and monarchal governed (redundancy acknowledged) countries is here.